The router in your home or business network can make or break your VoIP service. This device is your gateway to the Internet so it is not only critical to have it setup and configured correctly, it is also important to choose the right device in the first place. In a very crowded marketplace, the choices seem almost infinite, so in this guide we will take a look at some of the best routers and help you select one that plays well with VoIP. Since home and business networks typically have different requirements, we have split this list of routers into two and focused on our favorite choices for either your home or business. No two businesses are alike so there is no one size fits all router that will work for every business. Requirements will vary based on the size of the company and as such the size of the network, the number of computers and the number of phones. Some very basic considerations are how many actual network ports you will need for both LAN and WAN, will you need Power over Ethernet (PoE) for your phones, do you need wireless connectivity, do you need Gigabit Ethernet speeds and what about QoS (Quality of Service). Don’t forget to think about what you might also need in the near future if your company is growing. Router prices typically start at around $50 for an entry level device while more powerful higher end routers with additional features and ports can easily end up costing thousands of dollars. With this in mind, it is important to understand what you need before you even start looking. The following list presents 5 of the best routers available for VoIP with a range of prices under $1,000. Description: The Netgear WNR3500L Router is an entry level router that may be a low cost consideration for small businesses with only a few phones on the network. It is a robust router that allows for easy configuration of QoS to prioritize the voice traffic. Disabling of SIP ALG is supported which is important as SIP ALG can be a problematic feature in ensuring consistent connectivity of phones to your provider. When it comes to security it features double firewall protection and DoS attack prevention in addition to Wi-Fi Protected Access (WPA/WPA2—PSK) and WEP. Configuration is performed via Netgear’s easy to use web interface. This is an open source router that can use 3rd party firmware called tomato to allocate bandwidth. Description: The Cisco RV320 is a powerful small business router packed with features at a very affordable price. The dual gigabit Ethernet ports allow for two connections to your Internet service provider resulting in a solid setup for both load balancing and redundancy. Security features include a firewall, SPI, DoS prevention, remote management, https, SSL VPN and SIP ALG. All of these can easily be enabled or disabled via an easy to use web interface. As always we recommend disabling SIP ALG. Voice traffic can easily be prioritized through use of the bandwidth management menu in the configuration wizard. Cisco also offers the RV325 model which is similar to the RV320 except that is has 14 Gigabit Ethernet LAN ports. Recommended or sold by: We are not aware of this router being sold by any providers at present. Description: The Linksys WRT1900AC is a higher end router that would typically be used by a consumer in a home. While it has powerful wireless features, it lacks some of the security and configurability that are essential for VoIP applications. The reason that we have listed it here is that it has a powerful 1.2 GHz dual-core ARM processor, and it is open source ready and developed for use with 3rd party firmware such as OpenWrt, which allows for much more granular configuration of features that are necessary for high quality voice communications. Not recommended for larger telephony installations. Description: The Dell Sonicwall SOHO device is a network security firewall that can act as an effective router on the edge of your network. This is a truly business class firewall and like most devices or services targeted towards businesses, there are license fees to get access to additional features and support. For an additional $91.25 per year you have access to the TotalSecure bundle that enables a full suite of advanced security features. If you need wireless, that option is available for an additional onetime fee of $140. Don’t forget product support that starts at $78 per year for 8x5 access. This device is certainly worthy of consideration if you feel the need for this level of security and support. Be aware that you will need to be technically savvy to configure some of the more advanced features. Features: 10 Fast Ethernet (10/100MBps) ports (x2 WAN, x8 LAN), Enterprise class QoS, PoE option, 802.1Q VLAN support. Description: The Adtran NetVanta 3448 is a multi-service access router that utilizes Adtran’s RapidRoute technology to deliver high throughput speeds. Mission critical traffic can easily be prioritized using advanced QoS features that include LLQ, WFQ, CbWFQ and Diffserv. This device also features Adtran’s VQM (Voice Quality Monitoring) feature that helps in the troubleshooting of VoIP related issues. Strong security features are also available in the form of SPI, DoS protection, ACLs and ACGs. Although it is possible to use a CLI (Command Line Interface) to manage this router, Adtran also provides a web based user interface that makes configuration easier. All of the aforementioned routers will play well with VoIP and deciding which one to choose is a matter of determining how much you want to spend, what you really need and how technical you are willing to get. If you are thinking of upgrading your existing phone service to a hosted solution, talk to your new provider and ask which router they recommend. Consumers have different requirements than businesses when selecting a router for a home network. More often than not, people rely on the router supplied with their cable TV service and this can in fact be a good option if you only ever want to surf the Internet and have WiFi access. Unfortunately these routers are rarely up to scratch when it comes to offering even the most basic feature set, and most have limited options for configuring security and quality of service. So if you can, we recommend that you do not use these devices as your primary router and replace it with a much more powerful one. Yet again you are presented with literally thousands of routers to choose from and it is a difficult task to perform research and successfully select a device that meets your needs. Some of the key features that rank most important to consumers are speed, security, QoS, parental controls, guest network, integrated firewall, media server and of course wireless capabilities. Each of these routers supports QoS, has port forwarding capabilities and allows for SIP ALG to be disabled. NAT stands for Network Address Translation and is used by every router to translate your public IP address into private IP addresses. There is a very limited supply of public IP addresses so NAT helps solve this problem as every device you have in your home or business requires an IP address. If this does not make any sense to you, don't worry as it is mainly supporting information for what we are about to tell you. If you do go ahead and buy a new router for your home then you need to be careful in how you connect it to your network. If you replace an existing router then there should be no problems. 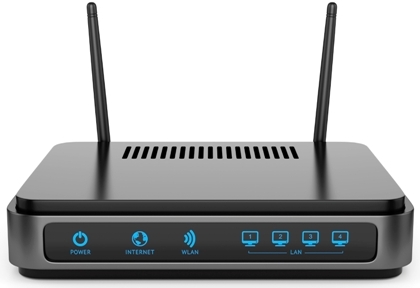 If you decide to connect a new router to an existing router then you will have introduced a second private network as your new router will be performing NAT along with your existing router. While you can typically get away with this double NAT scenario for you PC's and other devices, it can introduce intermittent issues with VoIP. The bottom line is to make sure that your VoIP adapter remains connected to your primary upstream router such that only a single address translation is being performed.